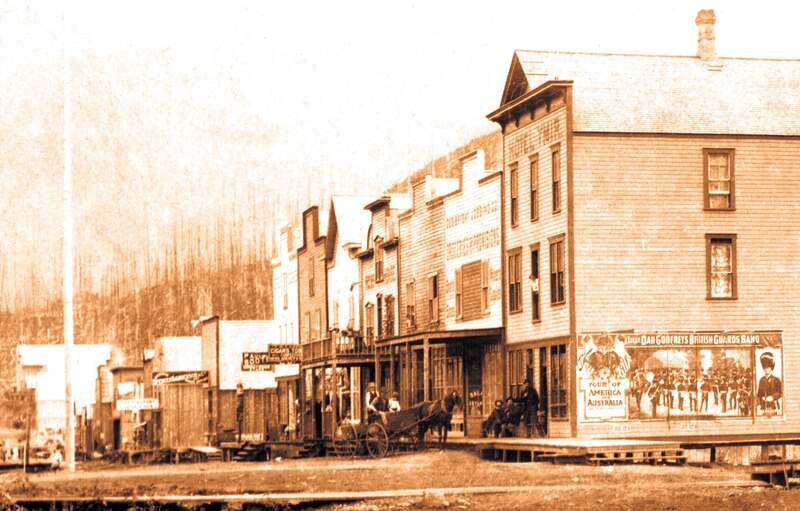 About 1885, the placer gold mining on the Pend d’Oreille River was coming to a close. The placer miners in this area started to look for other st-reams that might produce the precious metal. They started moving north up the Salmon River to try their luck in the river and its tributaries. A few of them settled at the mouth of a small stream at what is now the present location of Ymir. They constructed three or four log cabins and named both the creek and settlement by the same name, Quartz Creek. These intrepid miners eked out a living by extracting gold from the creeks in the area; no doubt, they also did some trapping in the winters. In the early 1890’s, the Hall brothers from Colville, Washington, came into this area to search for lode mines. They discovered outcroppings of what eventually became the Ymir Mine, but due to the lack of roads or any other means of travel in the area, they continued towards the Nelson area and they located the Silver King Mine, which developed into a rich silver, gold, copper operation. The Hall Mines Smelter in Nelson and Hall Creek, six miles north of Ymir, was named after these two Indian prospectors. In the summer of 1895, Jerome Pitre, Joseph Pitre and Oliver Blair staked claims that were to become the famous Ymir Gold Mine. This was followed by the staking of many more claims in the Ymir area. All this staking activity did not go unnoticed by D. C. Corbin, the American railroad magnate, and he commenced to prepare for construction of a railroad from Northport, Wash. to Nelson. This railroad became known as the Nelson – Fort Sheppard line. This line proceeded along the Columbia River from present day Waneta through Fruitvale to Erie, Salmon Siding, renamed Salmo and on to Quartz Creek. D.C. Corbin constructed the station a short distance north of Quartz Creek and renamed it Ymir, after the Earth God of Norse mythology. With the completion of this railroad, Ymir really blossomed forth as a major mining community. The Ymir Mine was the largest and the best producer. It started with a forty stamp mill and later added another forty stamps, making it the largest stamp mill in the British Empire. There were many other mines that started during the ensuing boom, Porto Rico, Dundee, Wilcox, Blackcock, Howard, Hunter V, Yankee Girl, Goodenough, Tamarac and many others. Some of the better known prospectors were Jerome and Joseph Pitre, Alex Gayette, S. Bywater, E. Peters, and in the later years, Tom Wilkinson, Joe Dunn, Ed Emilson, Oscar Anderson, Ed Haukadahl, John Rankin, Alex McDonald, H. Jackson and many others. J. W. Ross, was formed and constructed in 1897. It serviced the whole town and was the envy of all the smaller mining towns of that period. The population at this time, was 800. But the area surrounding and serviced by the town contained another 400, at the least. All the mining in the Ymir camp was done for the gold content, while silver and lead were also recovered; they played a minor part in the overall net returns. The Ymir Mine was, by far, the most important one in the area. It started out with forty stamps and added forty more, making it the largest. The other mills in.the area, had a total of sixty stamps, making a total of 140 stamps in the vicinity of Ymir. Each stamp could crush and pulverize 2Y~ to 5 tons of ore per hour. This came to aproxximately 4000 tons of ore per day. There was also many smaller mines shipping crude ore directly to the smelters at Trail and Nelson. This flourished until the early 1900’s; most of them ran out of ore reserves. It should be noted that the area had sawmills at the mouth of Porto Rico creek, Ymir and at the mouth of Porcupine Creek; these sawmills provided most of the lumber for the construction of the town of Ymir and all the buildings and houses, etc. at the various mines. All this meant that there was a lot of men employed in logging and sawmills in and near Ymir. An interesting footnote: The Ymir Mine alone used one cord of firewood per hour, each and every day of the year, just to keep their steam boilers working. Most of the mines ore bodies were depleted by about 1905, and due to the low price of gold ($20.00 per ounce) and poor demand for other metals and minerals, Ymir fell on hard times. It did pick up somewhat just prior to the war of 1914 – 18, as the demand for minerals increased because of the need for them in the war effort. It can be said that Ymir’s fortunes were at a low ebb from 1919 until 1955. At this time, the United States and England set, by mutual agreement, the price of gold at $33.00 per ounce. This caused a second boom in Ymir, and by 1936, there were four more mills operating in the district, Goodenough, Yankee Girl, Wesko and the Durango. Plus, a lot of exploration by other mining companies, quite a number of leasors, shipping ore to the Trail smelter. This writer arrived in Ymir in July of 195? and can attest to the fact that it was a very busy town. In September of 1959, Canada declared war on Germany, this had a bad effect on Ymir’s fortunes, for several reasons: a lot of the younger miners joined the Armed Forces and this along with the fact that more miners were needed in the other mines that were producing strategic war minerals, also the ore reserves were being depleted and the operating costs were starting to escalate. All this caused the closure of the existing mines. At the end of hostilities in 1945, Ymir’s population had decreased to it’s lowest since 1896, with only about 125 living here. During this period, a lot of exploration work was carried out in the Ymir/Salmo area, this resulted in three large lead, zinc mines and also one tungsten mine. Most of the mining of this era was a considerable distance from Ymir, but due to the upgrading of the roads, and the availability of the automobiles, which had been in short supply during and after the war, this made it easier to commute back and forth from the mines. Ymir’s population gradually increased to about 550 in Ymir and the surrounding area. While mining is at it’s lowest point in the past 90 years, there’s a considerable amount of mining exploration in this general area, hopefully this activity will produce some more operating mines. In closing, I would like to state that mining is not necessarily finished in this area. There is no doubt that there is still minerals and metals to be found in this area, including: gold, silver, lead, zinc, and tungsten. Ymir, the Norse Earth God, will see to it that Ymir, as a mining town, will not be forgotten.